The Autumn is here and October and Halloween time with it. Are you already thinking about your Halloween costumes? Is your house already filled with decorations in the spirit of the Halloween time too? 🙂 So exciting! 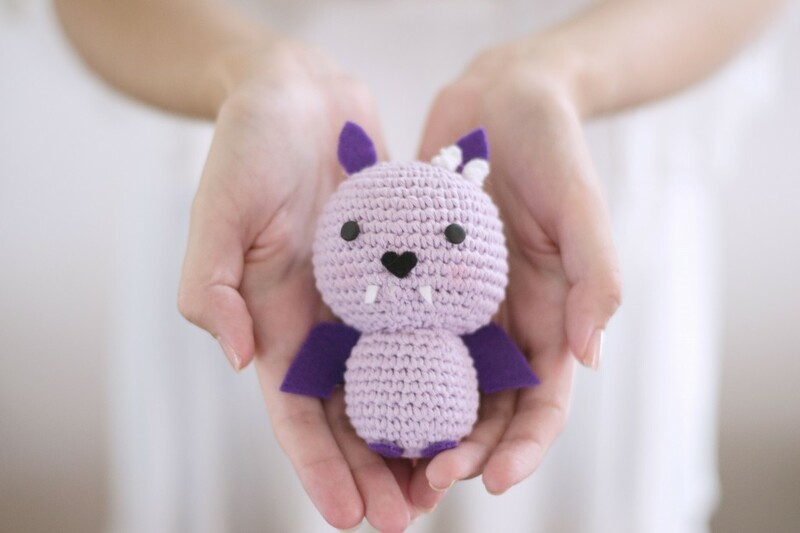 I was playing with my yarn and sketching some designers few days ago and created this cute amigurumi bat. I was using 100% cotton yarn, Cotton Light from brand Drops (this is not a sponsored post, I wish it would be, because their yarn is just phenomenal 🙂 and I would definitely recommend it) and my 3 mm crochet hook. I know there is no 3 mm crochet hook in US or it’s hard to find them, but you can use C/2 which is 2.75 mm hook or D/3 which is 3.25 mm hook instead. Just make sure that the stitches are tight enough and the stuffing would not start coming out through the stitch holes. 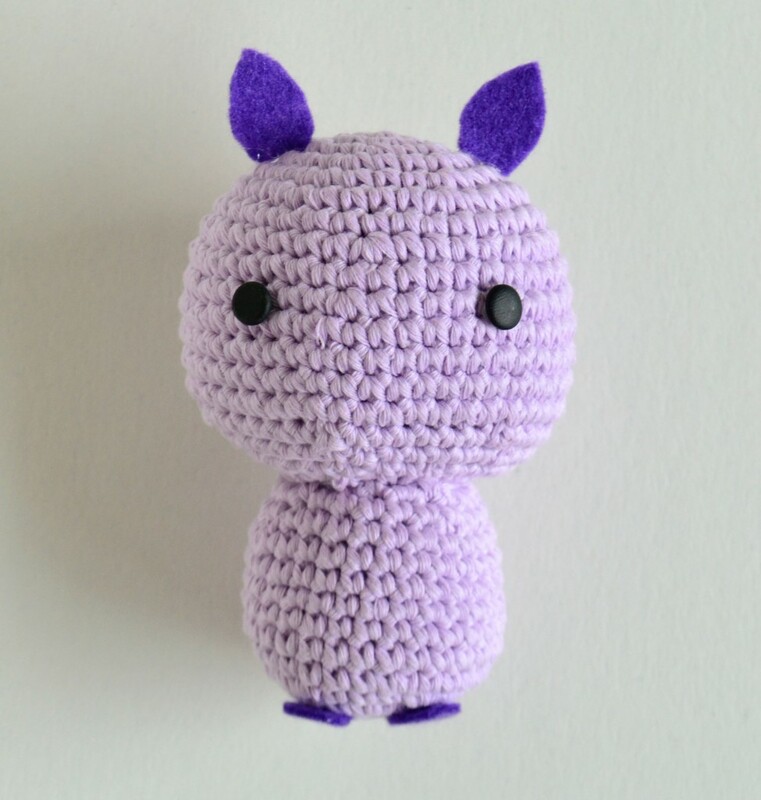 Something new for me, but common technique when creating amigurumi projects was using the felt material. I was using it for bat’s ears, wings and nose. 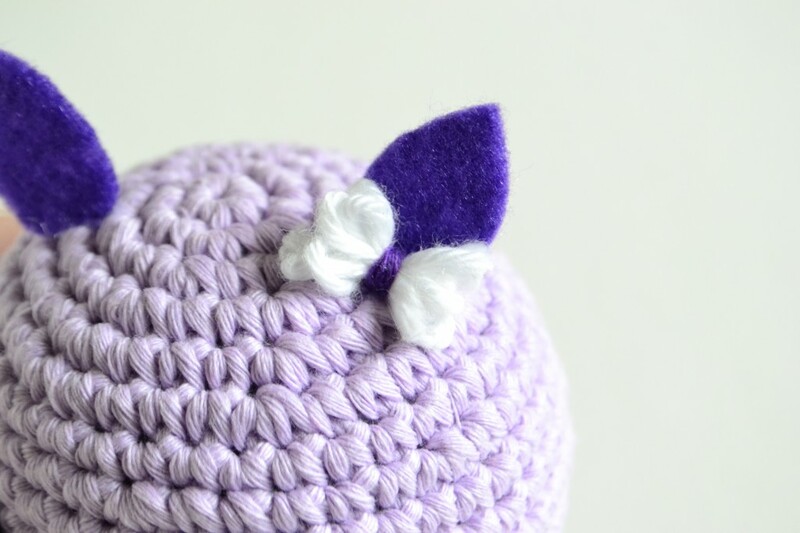 yarn: DK weight 100% cotton yarn in violet color, 50 g (1.75 oz) and very small amount of white yarn for the bow. 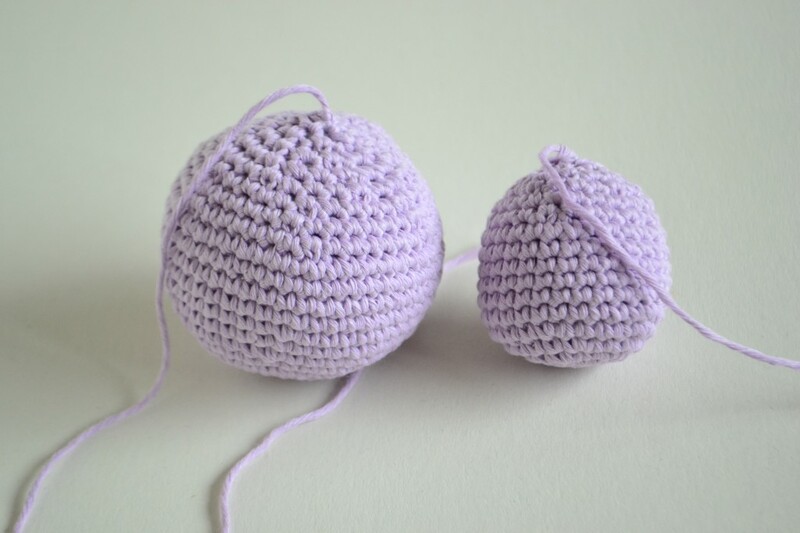 Gauge: 11 sts and 11 rows in sc measure 2 x 2 inch (5 x 5 cm). Important: Because I do not have the safety eyes at the moment I’ve made them from polymer clay and glue them on the bat’s hat. If you would like to place the real safety eyes, you can do this between round 10 and 11 and make sure you have 7 to 8 sts space between the eyes. Work in rounds. Do not join at the end of each round. Start with the magic ring. Round 1: Work 6 sc into the ring. = 6 sts. Round 2: Work 2 sc into next 6 sts. = 12 sts. Round 3: Repeat (work 2 sc into the first one, sc into the next one) 6 times. = 18 sts. Round 4: Repeat (work 2 sc into the first one, sc into the next two) 6 times. = 24 sts. Round 5: Repeat (work 2 sc into the first one, sc into the next three) 6 times. = 30 sts. Round 6: Repeat (work 2 sc into the first one, sc into the next four) 6 times. = 36 sts. Round 7: Repeat (work 2 sc into the first one, sc into the next five) 6 times. = 42 sts. Round 8: Repeat (work 2 sc into the first one, sc into the next six) 6 times. = 48 sts. Round 9 – 15: Sc into next 48sts. = 48 sts. Round 16: Repeat (join next two sts with invisible sc2tog, sc into next six) 6 times. = 42 sts. Round 17: Repeat (join next two sts with invisible sc2tog, sc into next five) 6 times. = 36 sts. Round 18: Repeat (join next two sts with invisible sc2tog, sc into next four) 6 times. = 30 sts. Round 19: Repeat (join next two sts with invisible sc2tog, sc into next three) 6 times. = 24 sts. Round 20: Sc into next 24. =24 sts. Round 21: Repeat (join next two sts with invisible sc2tog, sc into next two) 6 times. = 18 sts. Round 22: Repeat (join next two sts with invisible sc2tog, sc into next one) 6 times. Ss into the next stitch. = 12 sts. Round 6 – 10: Sc 30. = 30 sts. Round 11: Repeat (join next two sts with invisible sc2tog, sc into next three) 6 times. = 24 sts. Round 12: Sc 24. = 24 sts. Round 13: Repeat (join next two sts with invisible sc2tog, sc into next two) 6 times. = 18 sts. Round 14: Repeat (join next two sts with invisible sc2tog, sc into next one) 6 times. = 12 sts. Round 15: Repeat invisible sc2tog 6 times. = 6 sts. 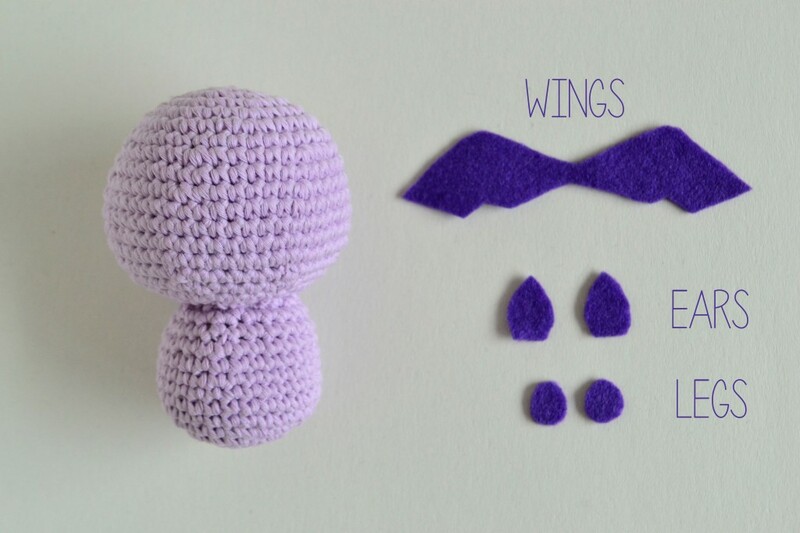 Take the violet felt and a scissors an cut the ears, wings, legs and the nose in shape of a little heart from the felt. 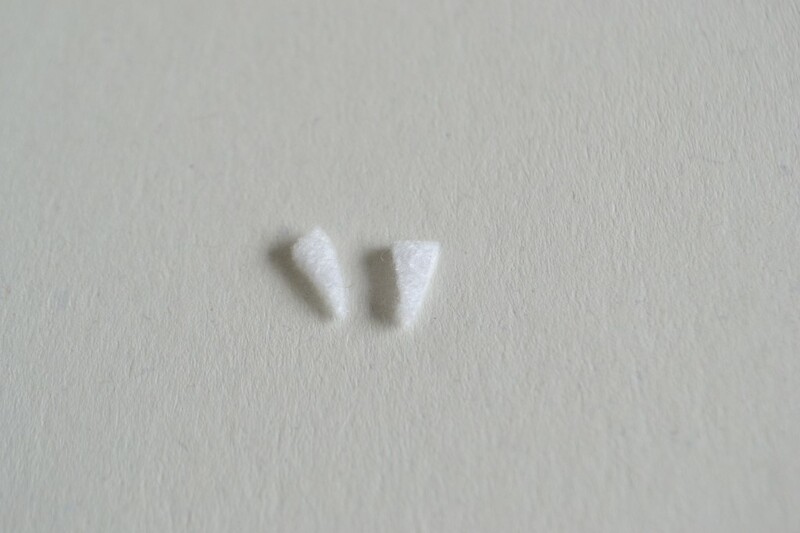 Take the white felt and cut out small teeth. Take the glue gun and glue all the parts on the bats body (back) and the head&nbsp;as seen on the picture. If you want, you can add a small bow in front of one of the bat’s ear. You can find the tutorial how to create the bow HERE. 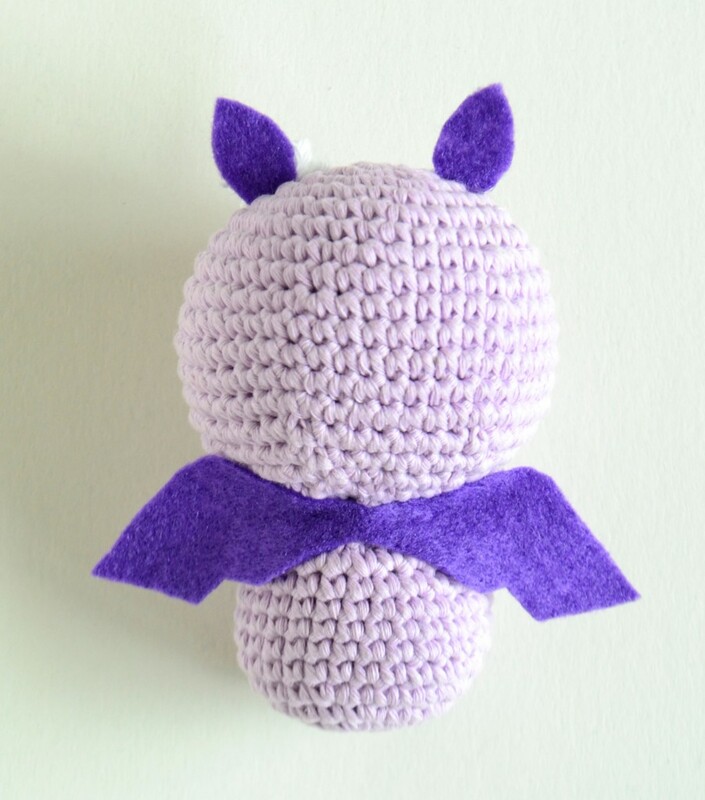 And now you have an adorable baby bat to decorate your office desk or any other part of your house! If you have any questions or find any errors, feel free to contact me. You can find more of my designs here on my blog. 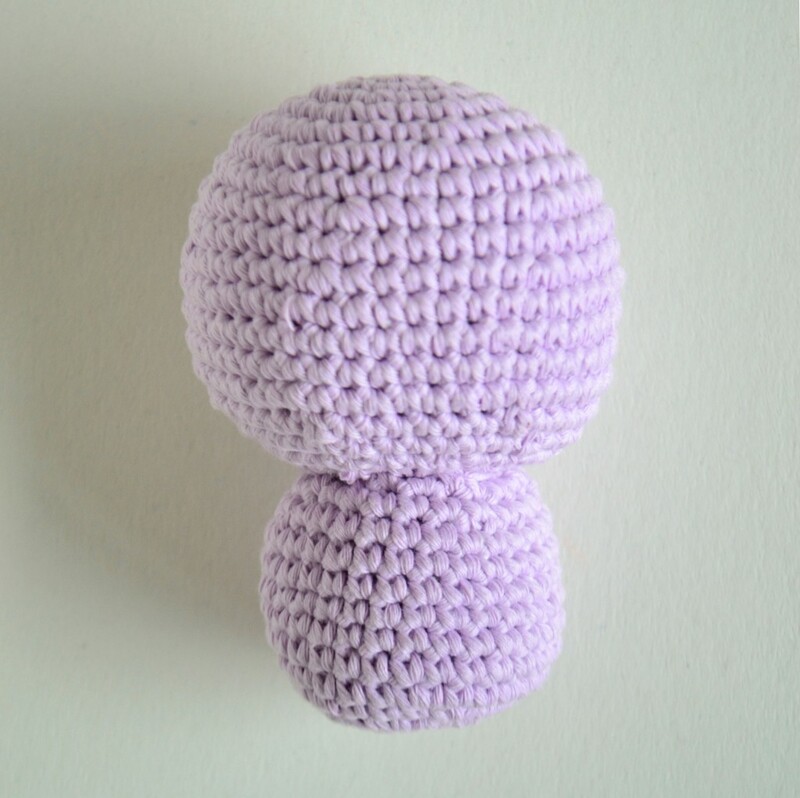 I post and share my patterns weekly, so keep checking that out. Happy crocheting!